Not to be confused with Jimmy Ward. 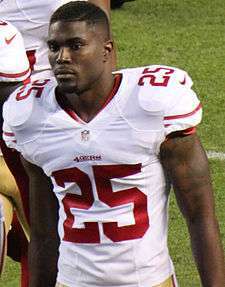 James "Jimmie" Ward (born July 18, 1991) is an American football cornerback for the San Francisco 49ers of the National Football League (NFL). He was drafted by the 49ers as a safety in the first round of the 2014 NFL Draft. He played college football at Northern Illinois. Born in Mobile, Alabama, Ward attended Davidson High School in Mobile. He led the Warriors in tackles as a senior with 101 tackles, 73 solo, as Davidson went 10-3 and advanced to the state quarterfinals, while earning team Defensive MVP honors. Also recorded eight pass break-ups, an interception, forced two fumbles and recovered three. Added three blocked kicks and three quarterback sacks. As a junior, he made 93 tackles, broke up seven passes and intercepted five. Also caused a pair of fumbles and blocked two kicks. Ward was considered a two-star recruit by Rivals.com. Ward attended Northern Illinois University from 2010 to 2013. In 2010, Ward played in all 14 games as a true freshman and blocked a school-record three punts on the year. He also recorded 21 tackles,a forced fumble and a pass break up, and was named the Huskies Special Teams Player of the Year and Freshman of the Year. In 2011, he appeared in all 14 games, and started 12. He was named a third-team All-MAC selection after recording a career high 100 tackles, 2.5 tackles for loss, an interception, four pass breakups, a forced fumble and a blocked kick. In 2012, he led the Huskies with 104 tackles, including a career game high 14 against Florida State in the Orange Bowl. He also recorded three interceptions while starting 13 games, earning himself first-team All-MAC honors. In 2013, he led the Huskies in tackles (95), interceptions (7) and pass deflections (12), while earning national recognition as a third-team All-American by the Associated Press. He also earned first-team All-MAC honors for the second consecutive season. Jimmie was selected by the San Francisco 49ers as the 30th pick of the first round of the 2014 NFL Draft. Although Ward played primarily strong safety in college, the 49ers announced he would be playing nickel cornerback for them. Ward came back as starting slot corner, after suffering a stress fracture in his rookie season. He improved drastically from the 2014 season. Some of his highlights include holding Randall Cobb to 4 catches for 44 yards against the Packers in Week 4, and getting his first career pick-six against Jay Cutler and the Bears in Week 13. The 49ers would go on and win that game 26-20. Ward later recorded his first career sack against the Bengals in Week 15. For the last four weeks of the 2015 season, quarterbacks had only a 32.3 passer rating when targeting Ward which was the best among all the corners in the NFL according to ProFootballFocus.